February 18th, 2016. 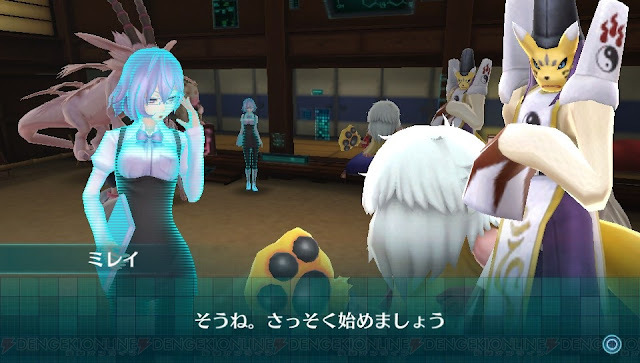 Japanese gaming news outlet Dengeki Online published an article giving an overview of several new aspects of Digimon World -next 0rder-, including the playable Shoutmon and Gumdramon, online multiplayer, the village of Flowtier, and postgame dungeons. The article provides a profile for Mikagura Mirei, a recurring character originating from Digimon World Re:Digitize, who has gone on to appear in several parallel universes through the Digimon canon. Previously Mirei acted as the host of the DigiLab in Cyber Sleuth. "One who watches over worlds. During a digitization experiment an accident occurred, and a part of her data was flung to the Digital World in a corrupted state. From a special information space, she has the power (administrator privileges) to travel to and from parallel worlds." Mirei: "There are cases where crises have caused the Digital World to encroach on the human world." Mirei: "That's right. Let's begin right away." 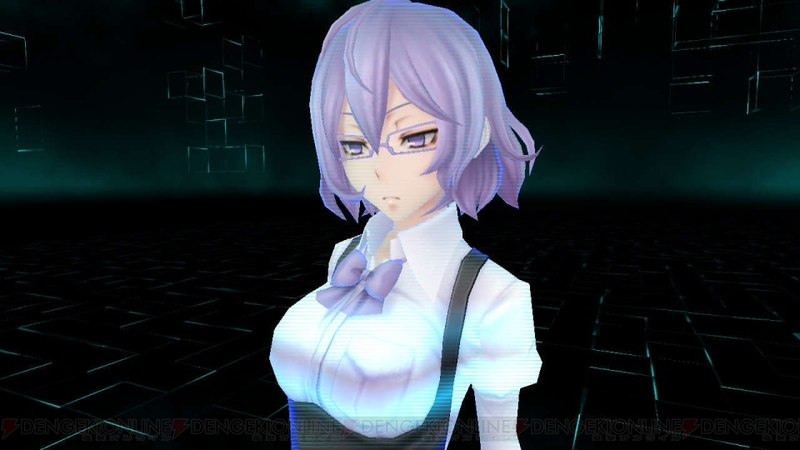 Mirei is voiced by Sawashiro Miyuki, known for playing Elizabeth of the Velvet Room in the Persona series. 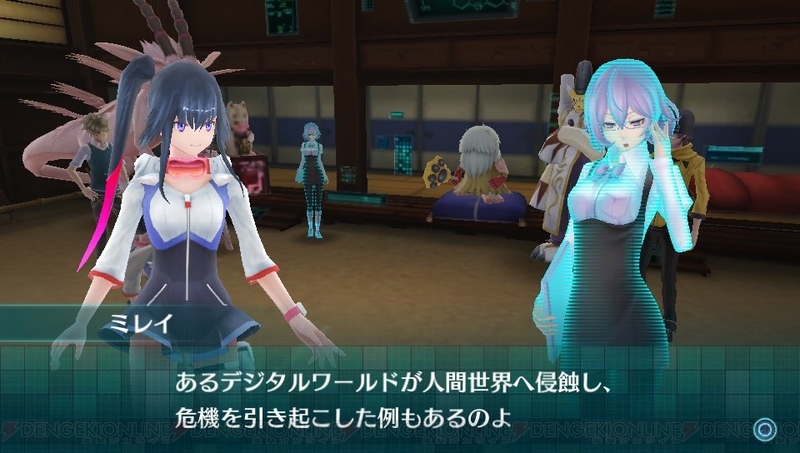 Her ability to travel between parallel worlds is how she's continued to appear in the newer Digimon games, connecting various universes across the Digimon Story and Digimon World continuities. 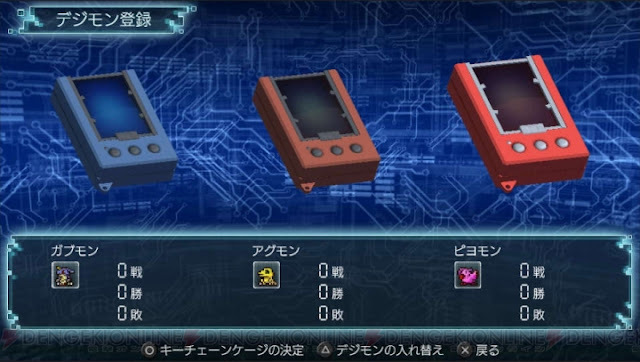 According to Dengeki, each area of the town of Flowtier corresponds to a section of the original Village of Beginnings from Digimon World. 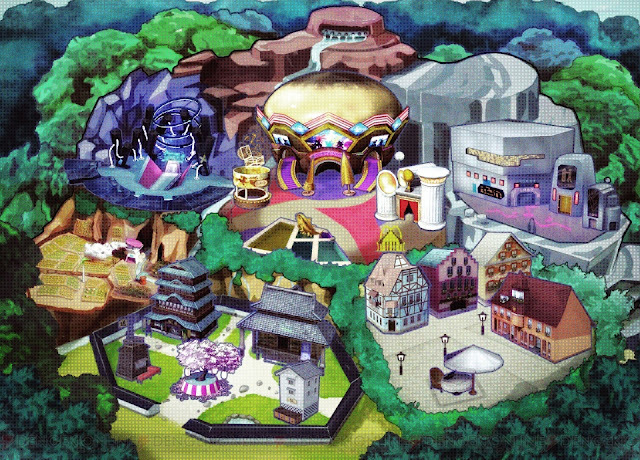 For example, the Central District contains Jijimon's house and a construction shop for improving buildings, and originates from the central area of the original game. The Commerce District contains item shops and restaurants, corresponding to the hospital and business areas of the original village. In addition to the coliseum expected of the Amusement District, it also contains a fishing pond for tamers to use. 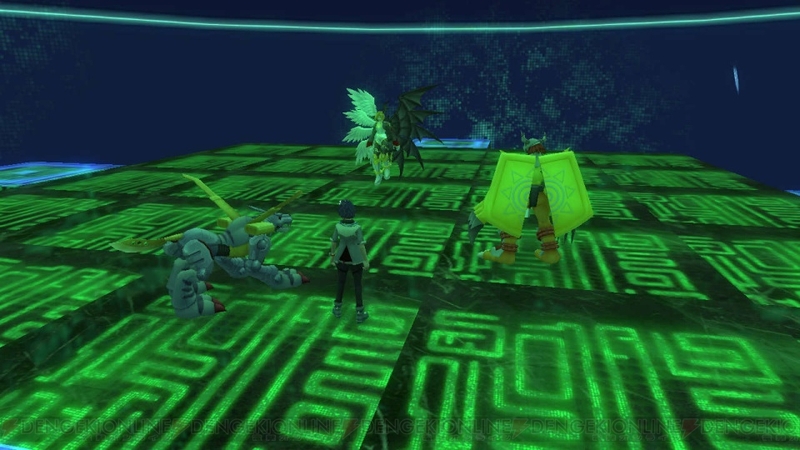 The Research District contains laboratories and training facilities, including an "Evolution Dojo" where tamers can get hints about their partners' evolution paths. The Different Dimension District is a mysterious area housing a dimensional transfer device. Flowtier starts as a small village and then gradually expands its facilities at the player progresses, opening up new areas. A player chooses which partners' data they want to upload to the network server. By downloading other players' data from the network server, players can connect and battle with the partners they raised. They can also change the type of keychain cage their partner is housed in, and modify their online ID that will be used as a display name. 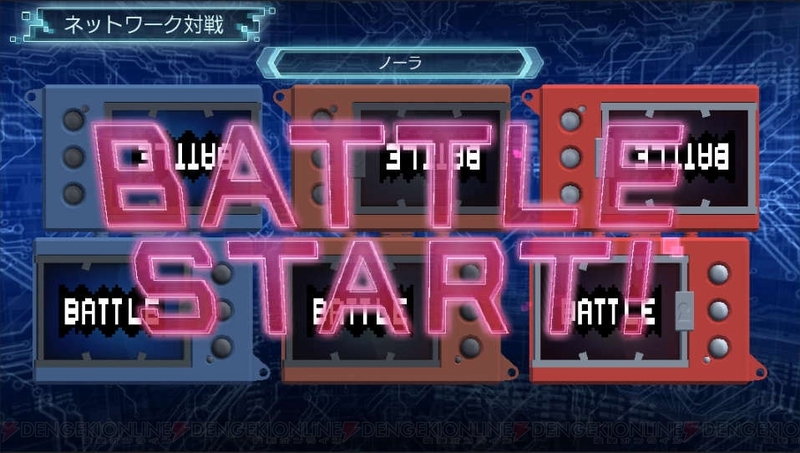 A player downloads their battle opponent's data from the server and then commences the battle. The visuals are designed to elicit nostalgia for the original virtual pets. Players can battle opponents from all across Japan. 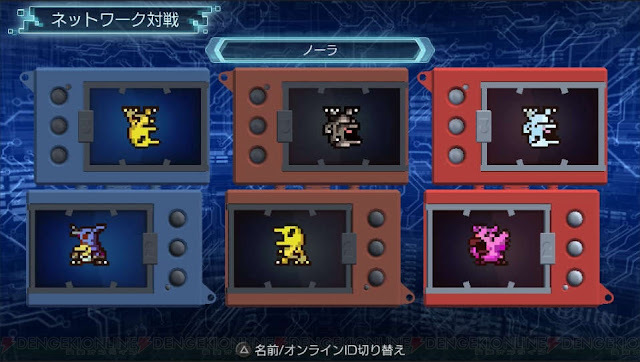 After tamers clear the story, they can access a postgame dungeon featuring the most difficult enemies available.